Last month Ferry Councillors had a site visit to the Queen Street car park opposite the Library. We were there to examine proposals for an enhanced number and variety of electric vehicle recharging points. This is to be funded from a share of a £1.86 million grant from the UK government's Office for Low Emission Vehicles (OLEV). As well as more rapid recharging points for cars, there would also be provision for the recharging of electric bikes and electric mobility scooters. I think many older folk in The Ferry who have extended their bike riding by shifting to an e-bike or those that rely on a mobility scooter will be pleased that their needs have been recognised in the plans for this proposed facility. 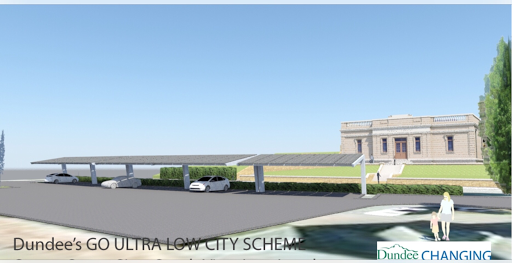 The two pictures show an artist's impression of what the new Recharging Hub might look like; it would be sited where the recycling bins are currently lined up. To accommodate the Recharging Hub, the recycling containers would be moved to the western side of the car park closer to the railway. This project is subject to consultation with the Broughty Ferry Community Council and The Ferry Local Community Planning Partnership.